The hottest comics crossover of the Marvel Universe is now the coolest con-exclusive Minimate 4-pack! Hope Summers may be humanity's destroyer or mutantkind's savior, but whichever it is, three of the most powerful mutants in the X-Men army have united to protect her from Captain America and the Avengers. 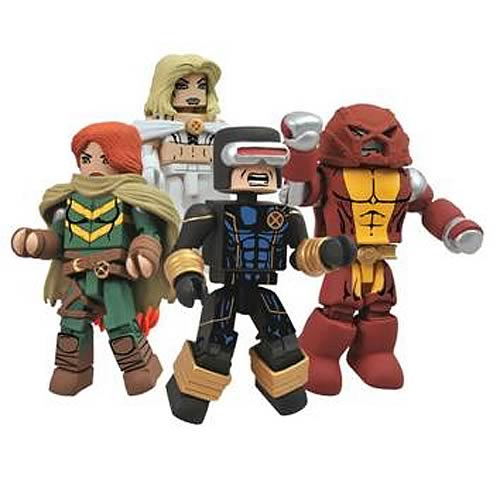 Hope's first-ever Minimate 2-inch tall mini-figure is joined by three Minimates of Cyclops, Emma Frost, and Colossus in his Juggernaut-inspired look. Limited edition of only 3,000 pieces! Ages 4 and up.